In this WordPress tutorial, you will find everything you need in order to create a website with WordPress. From installation to backups – we have covered it all. Be sure to check out the list of our newest WordPress tutorials at the very bottom of this page. WordPress first saw the light of day on May 27, 2003. The founders of this software are Matt Mullenweg and Mike Little. WordPress can be referred to as an online, open source site building tool based on PHP and MySQL programming languages. In more advanced terms it is called a content management system (CMS). When WordPress was first launched it had several users but over time grew into the biggest and most popular CMS in the world. Today, WordPress is powering over 75 million websites. A research carried out in April 2016 shows that this content management system was used by more than 26% of the 10 million best-ranking sites. However, for more in-depth coverage, you may continue reading below. After finding out the massive number of users WordPress has, it may leave you wondering, why is it so popular? A mixture of several factors should be taken into account. The general viewpoint is that WordPress is a simple blogging tool, however, it is much more than that. Due to the fact that WordPress is an open source project, it allows anyone to improve and edit its code according to one’s liking. It also features thousands of free plugins, themes, widgets and other tools. All these features allow you to create any type of website, starting from simple blogs, personal websites or portfolios, ranging to e-shops, knowledge bases or job boards. Another factor is that WordPress is completely free and supports all hosting platforms with PHP and MySQL. On top of that, this CMS is constantly updated with new versions which improve security, include new features and improve overall performance. Last, but not least, WordPress has a huge community with dedicated forums and discussions all over the internet. The amount of data that is available and thousands of WordPress tutorials also make WordPress one of the easiest to use content management systems out there. A content management system or CMS for short is an application with the ability to create, modify and publish digital content. In most cases, it also supports multiple users, allowing them to work in collaboration. For example, in WordPress it is possible to create several administrative users, each one having different privileges. Content management systems also include text and formatting features, the ability to upload videos, photos, audio, maps or even your own code. A content management application (CMA). The CMA can be referred to as the graphical user interface (GUI) that lets a user create, modify, remove and publish content without ever needing to have knowledge of HTML or other programming languages. A content delivery application (CDA). The CDA is responsible for the back-end services that manage and deliver content after it is in the CMA. The three most popular content management systems in the world are WordPress, Joomla, and Drupal. WordPress.com and WordPress.org are two ways of hosting a WordPress site. The thing that varies with these two methods is the actual host. By using WordPress.org, you may download the script free of charge and host it yourself on a local machine or with a hosting provider (such as Hostinger). On the other hand, WordPress.com takes care of all that by hosting the site for you. You don’t have to manage a web server, pay for hosting or download software, however, ads are shown on your site. Both WordPress.org and WordPress.com have certain pros and cons. If you are not interested in having your own hosting or managing a web server, then WordPress.com may be the way to go. It is free and can be quickly set up. You will also have various features and options for your site’s customization. However, it comes with a price. Your website will include WordPress.com in the URL and you will not be able to upload custom themes or plugins. The ability to edit or modify PHP code behind your site will also not be possible. Using a self-hosted version from WordPress.org provides more flexibility and control over your site. You will be able to use your own domain name, upload themes, plugins and install them. You will also have the access to your WordPress files, database, and code, meaning that you will be able to modify it according to your liking. The most popular and powerful WordPress sites are self-hosted, as it provides greater flexibility and the ability to implement custom functionalities, codes, and designs. Last but not least, in case WordPress is not the CMS for you, having your own hosting account will allow you to test other content management systems such as Drupal or Joomla. This WordPress tutorial will focus on the self-hosted WordPress version. MySQL version 5.0.15 or greater or any version of MariaDB. You would probably have to search for a hosting provider which lacks WordPress support. Many hosts use various auto-installers to make the WordPress installation process as simple as possible. By using auto-installers, users no longer have to deal with database creation or file uploading. In this part of our WordPress tutorial, you will learn two different ways to install WordPress. Before proceeding with WordPress installation, you need to decide on how you want to access your website. Do you want WordPress on your domain name root (example.com), subfolder (example.com/blog) or subdomain name (blog.example.com)? Only if you want to setup WordPress on a subdomain name, you will have to take an additional step and create a subdomain name. On Hostinger this can be easily done in the Subdomains section. Locate Auto Installer and open it. Enter WordPress in the search field and click on its icon. URL – The URL where WordPress should be installed. If you want to install it on root domain name (example.com) then leave it empty. Language – Choose WordPress language. 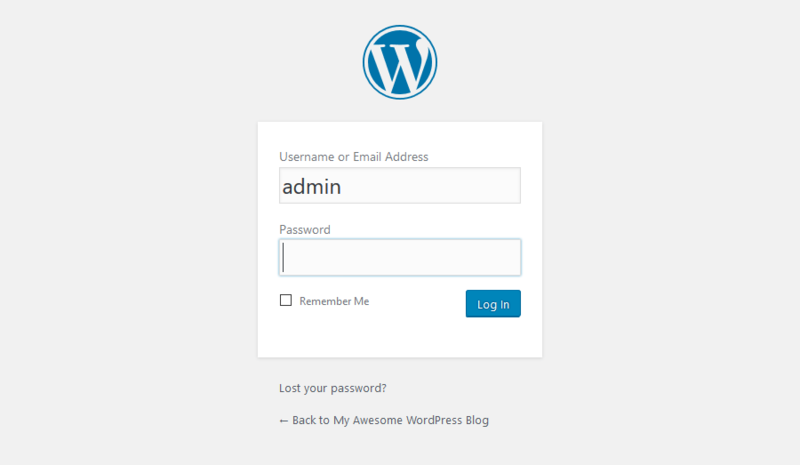 Administrator Username – Your WordPress admin username. You will use it to access WordPress admin area. Administrator Password – Your WordPress admin password. You will use it to access WordPress admin area. Administrator Email – Enter your email address. Website Title – The title of your WordPress website. Website Tagline – A short sentence explaining what your website is about. If you want to understand the basics and learn how WordPress works, you can install it manually. WordPress is famous for its 5-minute installer. The process is straightforward and similar to any other software installation. So if you have ever installed any computer program – it won’t be hard for you to complete the WordPress installation. First of all, download the latest WordPress from the official WordPress.org website. Once the download is complete, you can start uploading WordPress files to your hosting account. 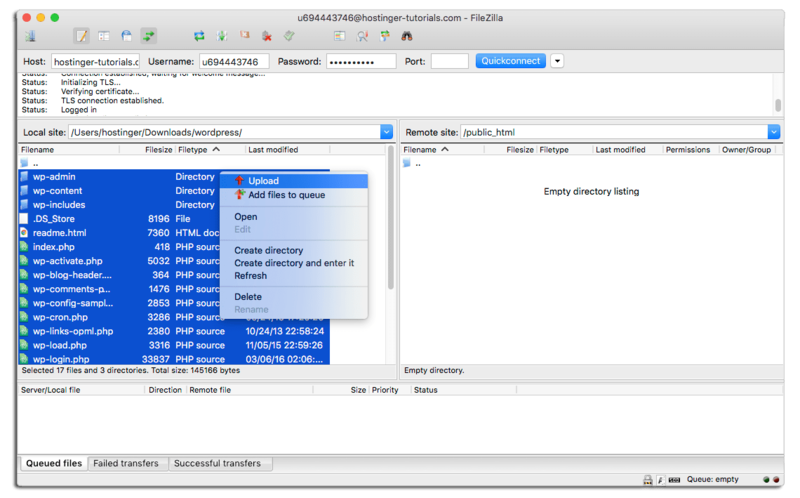 You can use either a File Manager provided by your hosting, or an FTP client. There is no difference which tool you will use to upload WordPress files. The only thing that you should take into account is the destination directory. For example, if you want to have WordPress on a root domain name, files should be uploaded to the public_html folder; if you want to serve WordPress from a subdomain name or a subfolder, upload the files to the appropriate directory. WordPress stores information in the database. Thus, it’s mandatory to create one. On Hostinger, a new database can be created in the MySQL Databases section. Be sure to write down the database details as you will need them later. Now visit your domain name in order to start the installation process. You’ll be asked to fill in the MySQL database information, administrator details and the site information. 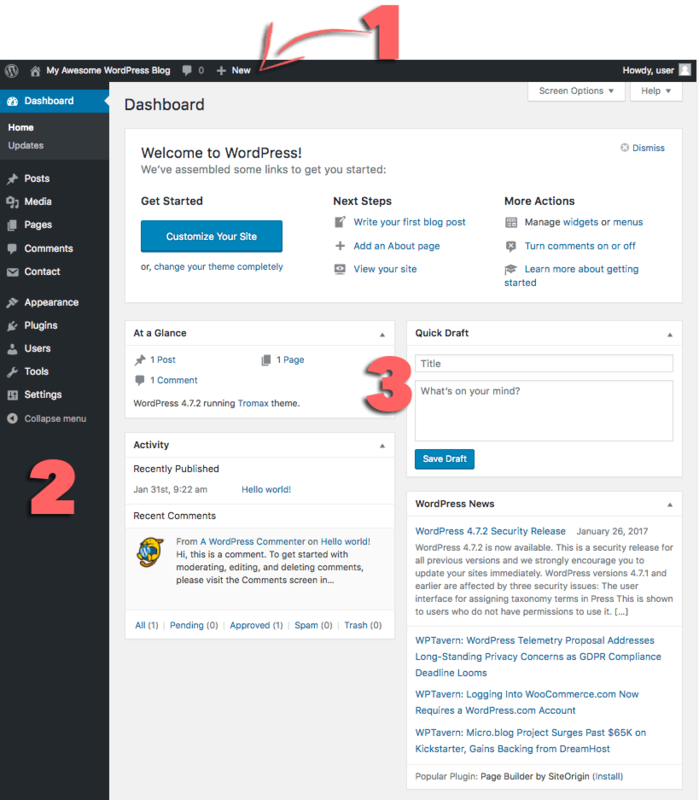 For more detailed instructions, see the tutorial on how to install WordPress on different hosting control panels. In order to find out how to migrate WordPress, see this tutorial. This URL will direct you to the login screen where you will be asked to enter the administrator’s username and password. Remember, you have entered these details during WordPress installation. If you have forgotten your password, click on the Lost your password? link. More detailed instructions on how to login to WordPress can be found here. A toolbar at the top of the page. It contains links to the most commonly used administrative functions and resources. For example, if you hover over your website’s name, you will get a link to the public view of your site. It also displays simple notifications like updates and new comments count. The main navigation menu on the left-hand side. It contains links to all administrative screens of WordPress. If you hover over a menu item, a submenu with additional items will be displayed. The first time you log in to the WordPress admin panel, you will see a welcome module which contains some useful links to help you get started. Once you are comfortable with the dashboard, press the Dismiss button in order to hide this module. At a Glance box will tell you how many posts, pages and comments you have. It also shows WordPress version and theme you are running. Activity box gives you a bit more information about your latest posts and comments. It shows the status of all comments and a short list of the most recent comments. Quick Draft box. Entering content into this box will start a new blog post. However, you cannot publish one from here as this box is only for taking blog posts ideas for you to come back to later. WordPress News. This module displays the latest WordPress news. Each of these windows has little arrows which you can use to quickly hide the box. You can also drag and drop them to different positions. 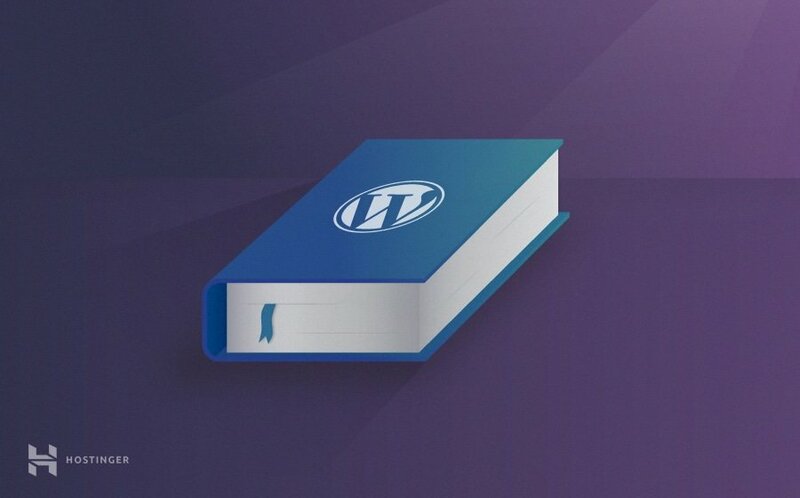 Creating a website with WordPress starts with publishing a new post or a new page. You may wonder – what is the difference between posts and pages? The answer is simple. WordPress posts can be categorized, tagged, archived. WordPress posts are used to publish time-sensitive content. In contrast, pages are mainly for static, dateless content. They don’t have categories or tags. Contact us or About pages are good examples of pages. To create a new WordPress post open the Add New section under Posts or choose New -> Post option from the top toolbar. You will be presented with an editing screen with an array of posting features. The first thing you should do is enter a title for your post. Secondly, enter the actual content of your post in the field below. If you want to format your text, use the toolbar options. It’s similar to the one you can find in MS Word or any other popular text editor. At the right-hand side of the screen, you can see the so-called meta-boxes. Each box has a particular function. Publish. Here you can change the status and visibility of your post, schedule it. By clicking the Publish button your post will go live. If you decide to delete the post, press the Move to Trash button. Categories. On this box, you can assign your post to a specific category. You can even create a new one by pressing the + Add New Category button. Tags box allows to quickly add new tags. Featured Image. Here you can assign a featured image to a post. It will be visible at the very top of the post (image location can be different depending on theme). In order to create a new WordPress page, open the Add New section under Pages menu or click New -> Page button at the top toolbar. Add New page section has identical WYSIWYG text editor just like the Posts section has. Thus, the process of text input and formatting is the same. You may also notice that Pages section does not have Tags and Categories meta-boxes. Instead, it has a box called Page Attributes. In this section, you can change the order of your pages and set parent pages. This is useful if you want to have several pages under one parent page. The primary purpose of WordPress plugins is to expand WordPress functionality. Just by installing and activating a plugin you can add new features to WordPress site without any coding. There are thousands of free and paid plugins built for different purposes: from social media sharing to security. Thus, you will surely find a plugin that fits your needs. Installing WordPress plugins is an easy task even for a beginner. Free and freemium plugins are available on WordPress.org plugin directory. 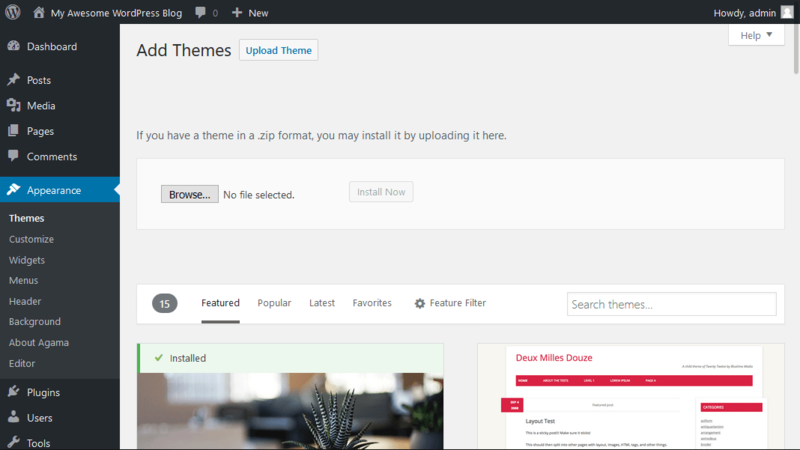 Just like themes, these can be installed by using the inbuilt WordPress installer. To install a WordPress plugin press the Add New button under Plugins and enter the name of the plugin you want to install in the search field. Hit Install and then Activate button. There are so many WordPress plugins – it could be hard to choose the right one. In fact, many of the plugins serve the same purpose, for example, there are dozens of WordPress caching plugins. That is why we decided to list the best WordPress plugins that are essential for every WordPress blog. Google XML Sitemaps. This plugin will automatically generate XML site maps for better search engine optimization. It’s easy to use and update it regularly. Yoast SEO. Probably the most popular SEO plugin for WordPress. It will help you improve the search engine optimization. From meta tags to writing suggestions – Yoast SEO plugin has it all. Wordfence Security. This plugin will keep your WordPress safe from hackers and malware. It has firewall and malware scanner modules which are super useful. Contact Form 7. Simple but very powerful WordPress contact form plugin. Create any contact or even lead generation forms with this plugin. It’s not recommended to clog Wordpress with dozens of plugins as it can decrease site’s performance. Keep your WordPress clean by installing only essential plugins and delete the ones you are not using. The look of WordPress site can be changed by applying themes. There are free and premium WordPress themes. Some of them are universal and can be used on any website. Others are built for a very specific purpose, for example, the e-commerce themes. WordPress made theme installation super easy. It literally takes just a few minutes to install free WordPress themes. In order to proceed, access the Appearance section and search for a nice looking theme. You can even filter themes by features or colors. Theme preview feature lets you see how your website will look with a selected theme. This is useful, as it will save your time – you will not have to install multiple themes just to find the theme that fits your needs. The above method is suitable for free and freemium themes only. What if you purchased a nice looking premium theme? In this case, you will have to upload the theme files manually. Access the same Appearance section, press the Upload Theme button and select the theme’s .zip file. It can take up to a few minutes for the uploading process to complete. Once it’s done, simply Activate the theme. Need exact steps? See a comprehensive tutorial on how to install themes. In this WordPress tutorial, we have now learned how to install and use WordPress in order to create and manage your very own website. As your WordPress site grows, so does the amount of text, images, code and other media files. A bigger website means that it will take longer to load. To avoid slow response time in WordPress, you should also invest some time in optimization. It will ensure that your pages load quickly and efficiently, thus, leaving your visitors happy and wanting to come back for more. Everyone has encountered a slow website at least a few times and felt the frustration that comes while waiting endlessly for it to load. Taking that into account, spending some time to improve your WordPress speed is a really good idea. The best part about WordPress is that it’s really easy to optimize due to the number of plugins and other tools available. You can make your WordPress site lightning fast without even having any coding knowledge at all. To get you on the right track, we will cover a few WordPress optimization techniques that will provide a notable speed boost to your website. The first step in optimizing your WordPress site is setting up a WordPress caching plugin. Is short, a cache is a temporary data storage. In most cases, active data is cached which results in reduced loading times. For example, when you access a frequently visited site, your browser will have a portion of the site’s static content located in its cache. As a result, the browser needs to request fewer files and information from the server which ultimately leads to quicker loading. WordPress caching plugins work by creating a static version of your website and delivering it, instead of loading all PHP scripts every time when someone refreshes or re-enters your site. You may find a detailed guide on how to implement WP Super Cache plugin for your WordPress site here. Using too large images. For example, you upload a 500 x 500 dimension picture but your site resizes it to 100 x 100. As a result, the visitor’s browser will have to download the larger file first, scale it down and only then display it. The proper way would be to simply upload a 100 x 100 dimension picture so that the excessive task of scaling down the image would be avoided. The image would also take up less space that way, resulting in an overall boost of speed. A detailed guide on how to locate such images and scale them down can be found here. Images are not fully compressed. You can save lots of space and bandwidth by properly compressing your images. Luckily, WordPress has a really great plugin that can help you with that, it’s called WP Smush. You can find a detailed guide on how to implement this plugin and optimize your WordPress images here. The more images your WordPress site has, the more beneficial this optimization task will be. Enabling gzip compression for a WordPress website is a great way to increase speed and performance. In short, gzip compression works by finding similar strings in a text file and replacing it temporarily, resulting in a smaller file size. HTML and CSS files have a lot of repetitive text and spaces, making gzip compression very effective. On the whole, it can reduce the size of a WordPress page by up to 50-70%. Enabling gzip compression via .htaccess file (recommended). A more detailed WordPress tutorial can be found here. Enabling gzip compression via WordPress plugins, such as GZip Ninja Speed. One thing that you should keep in mind is that gzip compression may slightly increase CPU usage. If CPU is not an issue, then gzip compression is a really great way to optimize your WordPress site. Implementing a content delivery network (CDN for short) will speed up WordPress by caching content in multiple data centers around the world. After a visitor enters your site, the content will be delivered by the nearest datacenter available resulting in a better front-end experience. CDNs also work great with WordPress caching plugins and there are free solutions to get you started. For example, CloudFlare has a free plan which provides both benefits of a CDN while protecting your site from DDoS attacks. For step-by-step instructions on how to implement it on WordPress you can check this WP tutorial. GTMetrix and other optimization tools suggest removing query strings from CSS and JS in order to improve caching of those elements. The previously mentioned WordPress plugin Speed Booster Pack is among a few others that can help you with this task. For more specific information you may refer to this guide for WordPress. Generally, when a web page is opened, all the content is loaded instantly, which is called eager loading. Alternatively, it is possible to delay the initialization of some objects (such as images) until they are needed, which is called lazy loading. The most common practice is displaying images only when they are visible from the visitor’s viewpoint or in the screen. All you need to do in order to take advantage of this technique is install and enable a plugin such as Lazy Load or Rocket Lazy Load. Last but not least, in order to have a successful WordPress site, you must harden its security. Just as WordPress is the most popular CMS in the world, it also turns out to be the most hacked. However, there are a few things that you can do in order to protect your site against hacking and other malicious activity. One of the most important factors in having a safe environment is to always update and use the latest version of WordPress, themes and plugins. Most updates include security tweaks, vulnerability fixes and prevent them from being exploitable in the future versions. A common practice among hackers is taking advantage of web pages that are running an outdated version of WordPress with a known vulnerability. By default, WordPress is updated automatically upon the release of a new version, however, it may not always work or the feature may be disabled on some hosts. Generally, when a new version of WordPress arrives, a notification will be shown at the top of your Dashboard. You may also update your themes and plugins via Dashbard-> Updates section. Admin is the username set by default in all WordPress installations. It is highly recommended to change it, as it will add an extra layer of security to your login credentials. Imagine a situation where someone knows your password, however, they are not aware of the username. The end result is that the person will still be unable to access your dashboard because they do not know the username. Leaving the value as admin can make the hacker’s job that much easier, therefore it should always be changed. When setting up a password, make sure to include numbers, capital letters and special symbols. In case you are having difficulties keeping track of all the passwords, you can store them using such tools as Last Pass. It will save the trouble of remembering all the different passwords while allowing you to go wild on the password difficulty. UpdraftPlus a plugin with the ability to backup WordPress to a remote location and restore it. BackUpWordPress is a light-weight backup plugin with automation. It allows you to exclude certain folders, schedule the execution time and has support for several different languages. These are some of the basic steps that you can take in hardening WordPress. For more security tips and tricks you can refer to our guide on how to secure WordPress. In this WordPress tutorial, we have learned about the history, structure of this CMS and types of WordPress hosting. Two installation methods were covered with a short tour of the dashboard, post, plugin and theme management. To get a good head start, we have also overviewed the most crucial WordPress speed and optimization techniques with a few security tips. If you want to continue learning about WordPress, check the list of our newest WordPress tutorials below.